Image 1 of 5. Click to view fullscreen. 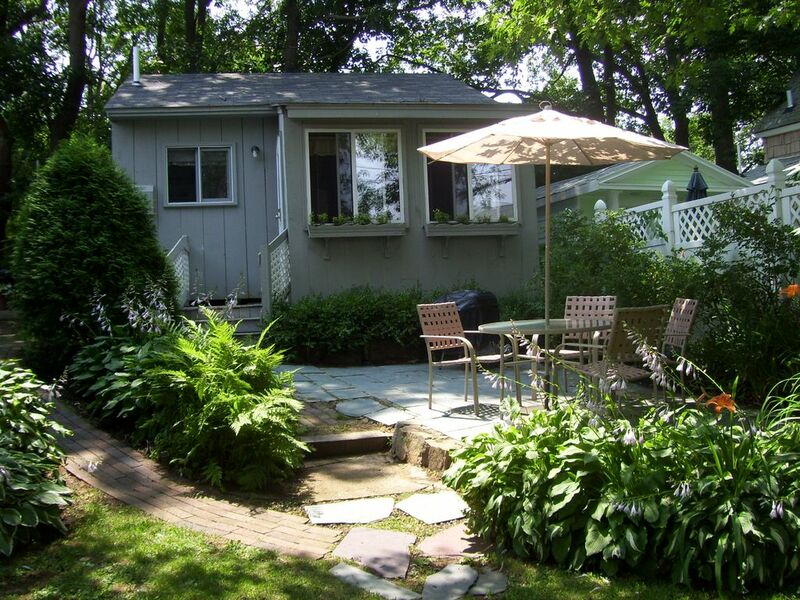 This cottage is very cozy, clean and comfortable and is just a 3 minute walk to the beach and town! There are 2 bedrooms, each with a double bed, kitchen, bath w/ shower, living rm. and a breakfast nook. Outside, there's a flagstone patio with table and chairs and a weber charcoal grill for all your grilling. Wireless internet. Have yourself a wonderful stay and Great experience!!!! We had a great time. Lovely location, very short walk to the beach, no more than 5 minutes. Small but perfect for a small family or a couple of friends. Very efficiently organized for such a small place. Had everything you need. Bring your own linens, towels, dish cloths/ towels. Very nice owners and very clean. There is no air conditioning but with fans it kept the breeze going and we managed through 2 of the hottest days of the summer. Well shaded. So it helped to keep things cooler. Would recommend it for a nice relaxing vacation. Exactly what we expected. Cute cottage with everything but linens and paper products. Very pleasant owners. Only a few minutes walk to the beach or town. Looking forward to visiting again and bringing friends! The price is right for this cottage! I actually stayed in the cottage next door to this one....I thought this was a cute place and clean! It was close to the beach and right for the price. The only negative was I wish there had been an air conditioner in the cottage as it got extremely hot the week we were there. We would stay here again though! We have stayed here for two consecutive years and have just booked our third. It's clean and quiet. Walking distance to Short Sands for many walks on the beach. The cottage has a full kitchen and deck with grill and table and chairs for staying "home", but it's close to many great places to eat breakfast, lunch aninner. Short drives to Ogunquit and Portland ME to the north and Portsmouth, Rye and Hampton NH to the south. We are located just a three minute walk to Short Sands Beach and the town of York Beach. There's an amusement park , playground, shops, restaurants, historical buildings, fishing and the Kittery Outlet Malls very close to us. We have three other cottages available.